A public charitable trust is usually floated when there is property involved, especially in terms of land and building. Trust may be created for any lawful purpose. Generally it is created for charitable, educational or socially beneficial activities. The main instrument of declaring a trust is the Trust Deed, which should be made on non-judicial stamp papers of prescribed fee and signed by the trustee or trustees for submission to the Registrar concerned. The trust deed should clearly spell out the aims and objects of the trust, how the trust should be managed, how other trustees may be appointed or removed, etc. A trust needs a minimum of two trustees; there is no upper limit to the number of trustees. The Trust registration procedure is very simple, if you are prompt with your all documents, thestartuppoint can help you in registration in 15 to 20 working days, subject to legal processing period. The application should be made to the official having control over the region in which the trust is sought to be registered. You have to provide all the details (in the form) regarding designation by which the public trust shall be known, names of trustees, mode of succession, etc. Our representative help you in further process like payment of nominal stamp fee etc. HOW TO FORM A TRUST ? 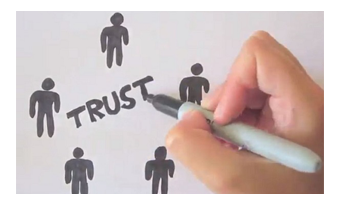 A Trust can be formed as per Section 4 of Indian Trust Act 1882 for a Lawful Purpose. A Trust should have a Document Written and Signed by Trustees or a sole Trustee. A Trust can be formed through a Will also. There is no definite form to create a Trust. Objectives of the Trust should be Clear and Unambiguous. WHAT ARE THE PURPOSES FOR WHICH A TRUST CAN NOT BE FORMED ? 2. Against provisions of Indian Trusts Act 1882 and rules made under the Act. 3. If there are provisions for Cheating etc. in the Trust. 4. If the Trust is intended to cause Loss or Damage to One's Property. WHO CAN FORM A TRUST ? 1. A person capable of making Contract can form a Trust. 2. Trust can be formed on behalf of Minor with permission of Civil Court. CAN A TRUST BE CANCELLED ? 1. Trust can be cancelled at the Will of the Trustees. 2. Trust can be cancelled if there is Provision for Cancellation in the Deed. 3. If Author of a Trust creates a Trust for the purpose of Repayment of his Debt and if this is not Informed to the Creditor, Author can cancel the Trust. CAN THE DEFECTS IN THE TRUST BE CURED BY AMENDMENT ? Yes, Amendment can be made by means of a Rectification or Supplementary Deed.